Cochrane, K.; De Young, C.; Soto, D.; Bahri, T. (eds). 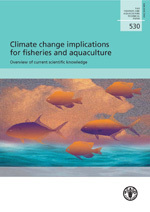 Climate change implications for fisheries and aquaculture: overview of current scientific knowledge. FAO Fisheries and Aquaculture Technical Paper. No. 530. Rome, FAO. 2009. 212p. An overview of the current scientific knowledge available on climate change implications for fisheries and aquaculture is provided through three technical papers that were presented and discussed during the Expert Workshop on Climate Change Implications for Fisheries and Aquaculture (Rome, 7–9 April 2008). A summary of the workshop outcomes as well as key messages on impacts of climate change on aquatic ecosystems and on fisheries- and aquaculture-based livelihoods are provided in the introduction of this Technical Paper. The first paper reviews the physical and ecological impacts of climate change relevant to marine and inland capture fisheries and aquaculture. The paper begins with a review of the physical impacts of climate change on marine and freshwater systems and then connects these changes with observed effects on fish production processes. It also outlines a series of scenarios of climate change impacts on fish production and ecosystems through case studies in different regions and ecosystems. The second paper tackles the consequences of climate change impacts on fisheries and their dependent communities. It analyses the exposure, sensitivity and vulnerability of fisheries to climate change and presents examples of adaptive mechanisms currently used in the sector. The contribution of fisheries to greenhouse gas emissions is addressed and examples of mitigation strategies are given. The role of public policy and institutions in promoting climate change adaptation and mitigation is also explored. Finally, the third paper addresses the impacts of climate change on aquaculture. It provides an overview of the current food fish and aquaculture production and a synthesis of existing studies on climate change effects on aquaculture and fisheries. The paper focuses on the direct and indirect impacts of climate change on aquaculture, in terms of biodiversity, fish disease and fishmeal. Contribution of aquaculture to climate change is addressed (carbon emission and carbon sequestration), as well as possible adaptation and mitigation measures that could be implemented.